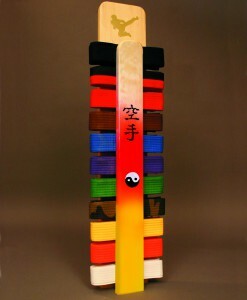 Each belt display is handmade and hand painted by various artists. Each one varies in the style painting from artist to artist, as personal styles between martial artists varies. 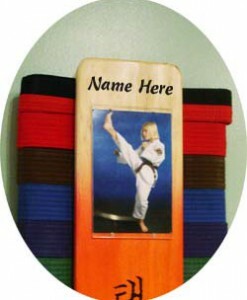 Just as each student is an unique individual, each belt display is unique. 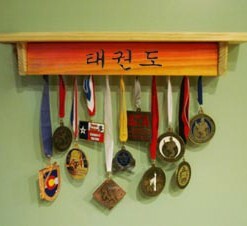 At the top of the belt display is written “Songahm Tae Kwon Do” in Korean. The symbolism portrayed in this belt display is steeped in the tradition of Songahm Tae Kwon Do and its metaphor using the pine tree and rock. 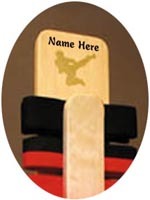 The bottom portion incorporates the meaning of the rock. 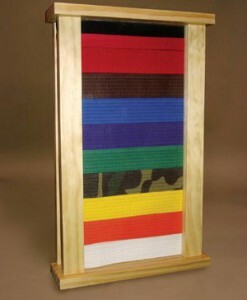 The amount of ground painted on the display gives it weight and signifies the solid foundation you will, or have, achieved in your training. It also represents the foundation of tradition on which your Tae Kwon Do career is based. 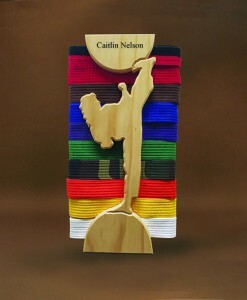 There are also three pine trees on the display. 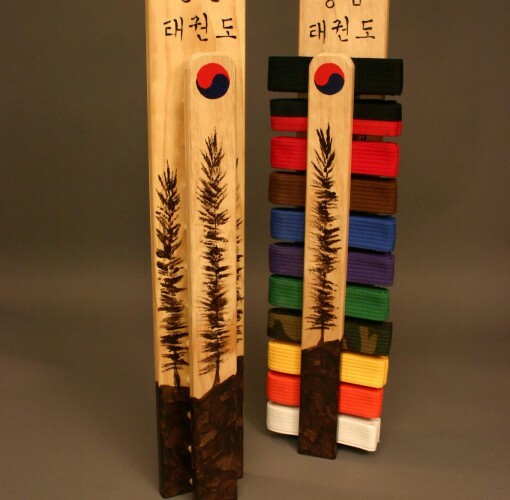 The pine tree in the middle of the display stands for you, the student of Tae Kwon Do, and your growth as you progress through the belt ranks. 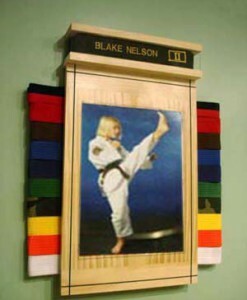 As you attain successive levels in rank and insert them in the display, the two pine trees on either side will start to be hidden. 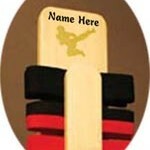 This illustrates Eternal Grand Master H.U. 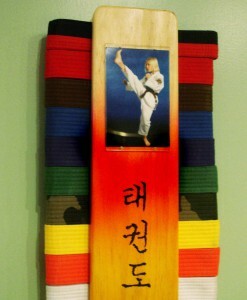 Lee’s parallel of learning Tae Kwon Do with the growth of a pine tree (ie: student). As you advance in rank, you must grow in knowledge and strength to establish yourself amongst the other trees (students) and grow to maturity. 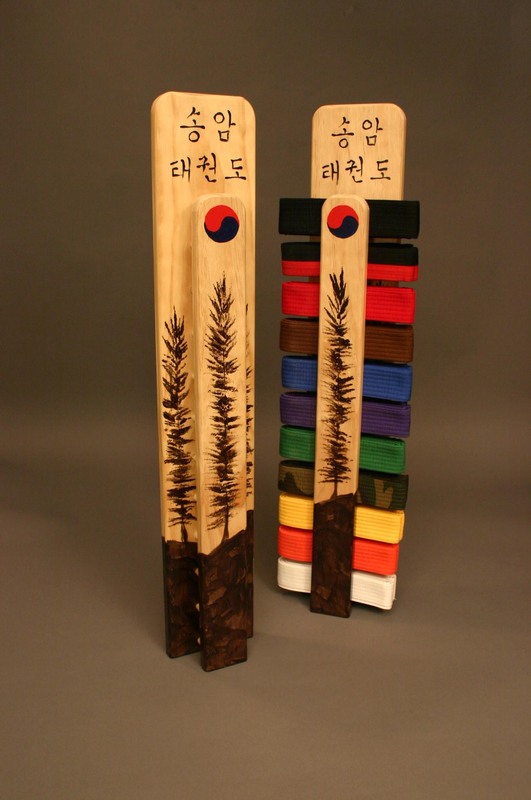 When you reach the goal of 1st degree black belt, the only tree visible will be the middle tree, signifying you have reached maturity. 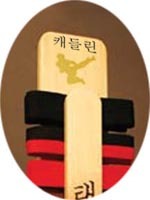 The Um Yang symbol sits in front of the top slot for the 1st degree black belt to denote the balance in life you have learned on your progression through Songahm Tae Kwon Do. 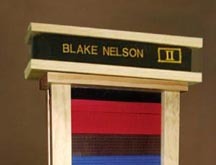 This display holds 11 belts. It can either be free standing or hang on the wall. 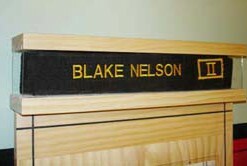 SKU: 200. Categories: Featured Products, Martial Arts Products.